SUMMARY: I have pioneered 2 new industries, own 5 companies and 3 game stores, completed several dozen successful Kickstarter campaigns, and host regular game designer events/conventions. I am a programmer (C, PHP, and Unix), designer, analyst, database admin (Oracle, Mysql, etc) and more … but when I can, I try to make my living doing things a bit more interesting than consulting or cubical work. This site is more about those other things I have done that are gaming related. I am owner and president of Minion Development Corporation (Game Universe retail stores), owner of Minion Games, and co-founder of OneBookShelf, Inc (RPG Now, Drive Thru Cards, War Game Vault, Drive Thru Comics) which has been responsible for many successful projects and stores over the years. I’ve been an entrepreneur and developer all my life, from my early childhood days of modifying the board game Pathfinder to include weapons and monsters, to programming my own Adventure style game on the Apple ][, to making my own dungeon tiles/corridors/doors out of wood in the mid 80’s, to developing my own BBS with text graphic city map (City of Aldimar) that you could wander and sewers to attack monsters on my Apple //e computer in the late 80’s. During the BBS chat board era I developed an AI for intelligent NPCs in a completely original MUD written from scratch in Unix and using Oracle database in the 90’s. These were the days of GemStone on Genie where it cost $6 per minute (yes minute) to play. I also owned Abyss.com for a few years before the Internet took off – rats should have kept that one eh? I started one of the World’s first LAN Gaming Centers in early 1994 (called the Virtual Gaming Center – first-ever license for playing network Shareware Doom). I have always enjoyed the process of creating things original and released several popular deathmatch levels: DMCath24, Tourney3.wad,Tourney2.wad, and more for the VGC tournaments. I was an operator and coder of WebRPG.com, one of the first online virtual table gaming software programs (written in Java). In 2001 and 2002. I hosted totally online gaming conventions at CyberCon with our own custom scheduling software and use of many virtual table tops. With hosts as grand as Gary Gygax, Tracy Hickman, Sean Reynolds, Steve Jackson and more. I created RPGRegistry.com to help players find players as well as a new site called PlayTesters.Net to help designers find play testers. In 2001 I created RPGNow.com (pdf download store for gaming) which pioneered the paper and pen RPG download industry. 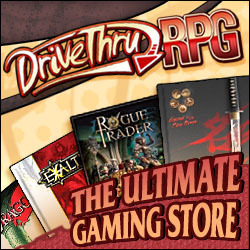 Years later I merged with our first serious competitor DriveThruRPG – now we are the largest reseller of the most role-playing games in the world (in print and out of print). In 2011 we introduced print on demand services and we are now the exclusive site to purchase out of print books for many large publishers such as White Wolf. I published a series of ePublisher Guides to help new startup companies. Also created and published a quick action sci-fi game system called Hyper-Killer. In 2002 I started RPGShop.com for online sales and clearance items at GameOverstock and RPGOverstock. It grew enough that in late in 2003 I opened our first brick and mortar game store: Game Universe in the Milwaukee, WI area. A large store of board games, role-playing games, dice, CCGs, and miniatures. In 2009 we opened our second store location in Brookfield, Wisconsin! In 2012 we opened a 3rd store. These stores are still open today though I have sold them off to my managers in 2017. In 2009 I started a board game publishing company: Minion Games and later that year I completed my first full-scale board game called “Those Pesky Humans” which was released at Origins 2010 with 3 other new games. In 2011 we published 7 great new games with the help of Kickstarter (a new, at the time, crowd funding platform), a couple of which are very high on several best of 2011 lists. Our biggest “hit” to date is The Manhattan Project which is ranked around 150 of all board games on BGG and the #1 seller from our fulfillment company. We followed this up with TMP: Energy Empire which won many best of 2016 awards. 2011 also saw the opening of our new Board Game index/database/review/trade mega site. With exclusive content from Scott Nichleson, Sandy Appelcline, Matt Thrower and even our own Web Comic – Trog’s Portal which I helped create. The site had a goal to provide pro-retailer friendly ads and tools. A place retailers can send people to find out more about the games not to steal their customers away from them. Alas, BGG was too big and entrenched and so the BGI site shut down after a year. We have now published 20+ games/products on Kickstarter and plan to do more. I personally helped dozens of campaigns with my Kickin’ It Games consulting company, but Kickstarter eventually stated we couldn’t continue to do so without taking on responsibility for those campaigns delivering. So we shut down KIG. I have left much of my knowledge in my blog posts on this site’s KICKSTARTER category. In 2010 I found out about a great little convention called Protospiel that helps game designers work with other designers to complete their tabletop games. In 2012 we decided to help the convention grow nationally and began pushing for others to running their own local versions. We started hosting a prototype game convention: Protospiel – Milwaukee and soon others around the country began to pop up. I also started something I called “Designer/Publisher Speed Dating” which we ran inside of other conventions to promote the pitching of games to publishers in a fast paced event. This event is directly responsible for several dozens of designers getting their games published. I’m now semi-retired and only actively working for Minion Games on projects that get done when they get done. I frequent and admin several Facebook groups to continue to help people in the industry. If you’re looking to contact me use the CONTACT ME page.